When it comes to banner advertising, we now have the ability to both target LGBT travelers across a variety of websites and mobile apps online, as well as target specific sub-groups of LGBT travelers, including as those interested in taking a cruise, or those focused more on luxury travel. We currently have a variety of these campaigns running now, including hotels and other tourism clients targeting LGBT travelers in Germany and the UK looking for a gay-friendly, warm summer destination to travel to. These campaigns run on a variety of platforms, depending on the client, including more traditional LGBT websites, as well as LGBT mobile apps including Grindr, Hornet and Scruff. More importantly, these same targeting opportunities are now becoming available on both Twitter and Facebook. With Facebook, they've taken it a few steps further. On behalf of Spain Tourism, we're now able to target LGBT travelers with a specific interest in travel to Spain, or one of the major cities in Spain such as Madrid, Barcelona and Ibiza. 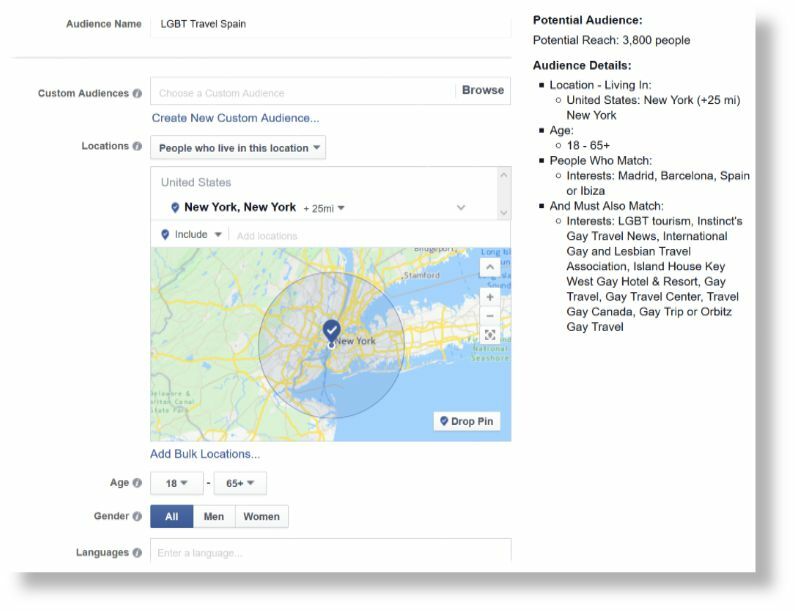 This kind of targeting was unheard of just a year ago, but with the ever-evolving world of online advertising merging with the wide variety of data sources available today from Nielsen, Experian, comScore and others, our clients can target their specific LGBT traveler like never before. 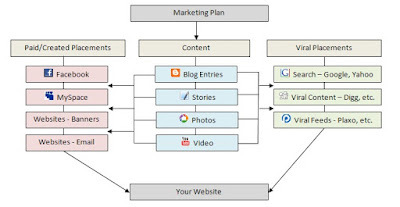 The 2nd pillar of this marketing program is focused on content, in the form of photos, videos and written form (blogs). Working with LGBT media, as well as bloggers and influencers in the LGBT travel world, Spain Tourism's campaign is able to be distributed far and wide via both website editorial placements (which index well in Google and Bing search), as well as social media placements and outreach including Facebook, LinkedIn, Google Plus, Tumblr, Instagram, YouTube and Twitter. Selecting the strongest LGBT media with a strong social media reach is key here, as it puts more traditional LGBT media on par with some of the strongest bloggers and influencers in the LGBT travel space. Utilizing hashtags such as #GayTravel and #GaySpain help to ensure that this campaign is discovered by both followers of individual LGBT media, as well as those simply perusing what is happening in the LGBT travel world of Spain. The 3rd pillar takes this social media and content marketing outreach to a whole new level, leveraging user-generated content (UGC) that is hand-selected to feature some of the best Instagram photos, YouTube videos and various Tweets and blog postings about LGBT travel to Spain. By monitoring both the social media activity on #GaySpain, as well as using more traditional systems to track any articles, blogs, photos or video about "Gay Spain", this campaign is able to bring together any and all conversations being had online about LGBT travel to Spain and ensure this campaign is an integral part of those conversations. 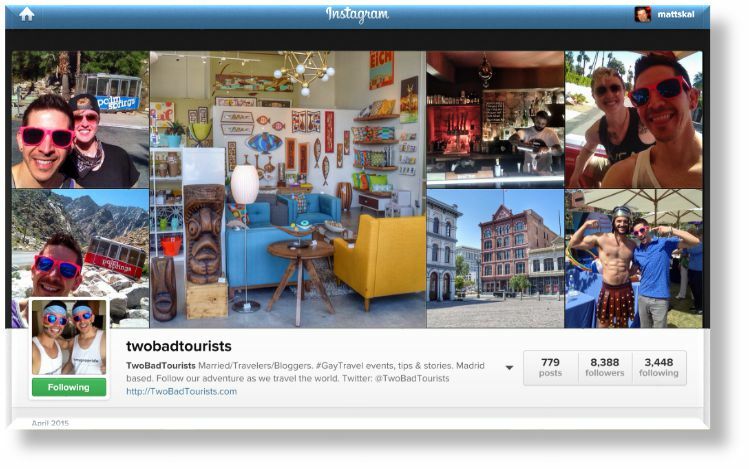 It's a social media "share of voice" that, when done right, keeps both the destination and the campaign front and center on an LGBT traveler's radar in a way that is non-intrusive and provides just the right balance of outreach and online interaction (in the form of comments, likes, shares and ReTweets) with these LGBT travelers. Optionally, bringing an online contest/sweepstakes into the mix, whereby the winner is selected who is the most social and the best at sharing the contest with their friends, solidifies this campaign as one of the strongest ways to keep a destination top of mind for an LGBT traveler. 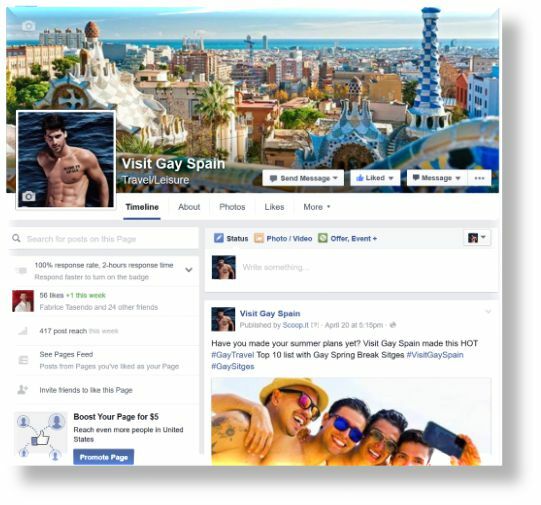 The entire campaign is brought together using its own unique URL, hashtag and social media profiles, in this case, @VisitGaySpain, #VisitGaySpain and www.VisitGaySpain.com. All of this social media activity can be measured for its overall reach and impressions, as well as share of voice.